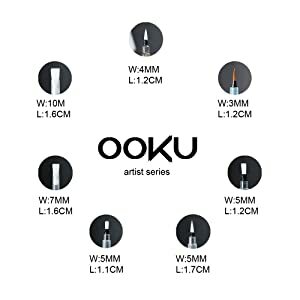 ?OOKU Artist Series - 7 pcs Set of Watercolor Brush Pens are ideal for art students, amateurs and professional artists given the addition of the Dropper + Tuner Watercolor brushes included in this set allow for a finer control and water flow when needed. 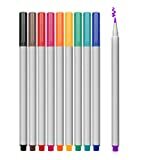 Assorted pen brush tips allow you to create fine, medium and daring strokes along with sleek consistent lines..
?EASY TO USE: Simply unscrew the watercolor pens' barrel to add water or ink. 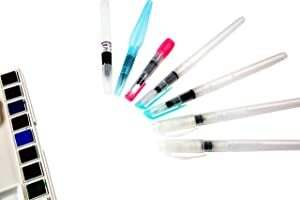 Easy to control the ink or water flow through the watercoloring brush tip. 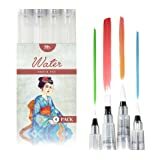 Easy to clean with less mess, well crafted, and no leaks around the seal, perfect for all water coloring needs..
?ARTIST GRADE PREMIUM QUALITY NYLON BRUSH: Designed with nylon brush tips which are soft and durable. 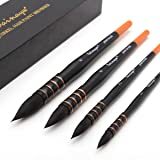 No spread or smear: brush tips stay intact and does not spray, spread, or smear while in use..
?MULTI-PURPOSE PEN BRUSHES: Can be used for solid colors or powdered pigment, use with squash watercolor pens, crayons, markers, and pencils to spread and smooth colors. ?BUILT TO LAST: Durable nylon brush tip holds its point even after repeated use. Made using superior production methods with OOKU satisfaction guaranteed - covering you with a lifetime defect policy..
Este producto fue vendido por última vez el 04/12/2018, 12:33 a.m. 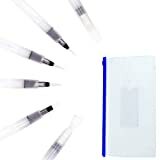 Create a watercolor masterpiece with OOKU's Artist Water color Brushes with Brush Pouch Organizer. Blend with water or add ink through the barrel and enjoy! Great for solid colors or powdered pigment, use with aqua watercolor crayons, markers, and pencils to spread and smooth colors. Made with premium quality nylon hair brush tips that holds its shape and does not spray, spread or smear. 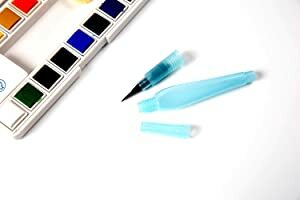 Expertly master fluid strokes for various types of watercolor painting and calligraphy. One thing that separates a good watercolor brush from a great one is control. 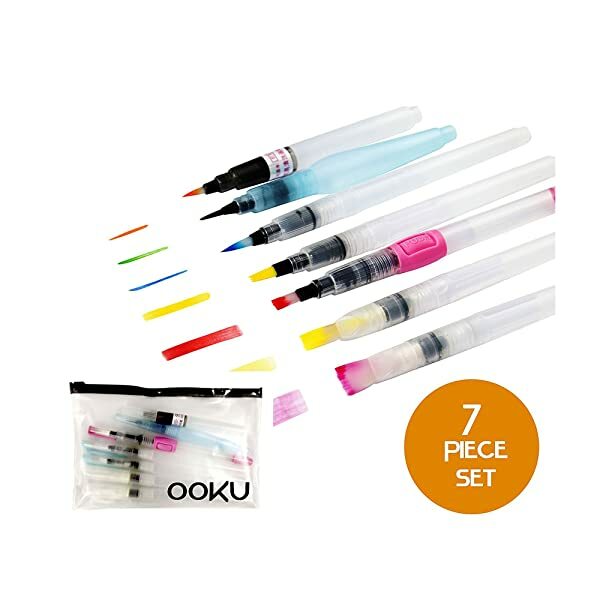 The OOKU water color brush pen set was designed to offer an unmatched level of control ideal for all skill levels and abilities. We've designed the watercolor brushes with fitted ergonomic barrel, a superior quality precise-release valve, and a nylon brush tip that holds its point to produce strokes just as you envision them. There is no need to Squeeze, Water reservoir holds the water and let gravity do it's magic but for more controlled water flow, squeeze the reservoir in the Waterdropper & Tuner brush to make water come out onto the brush tip. 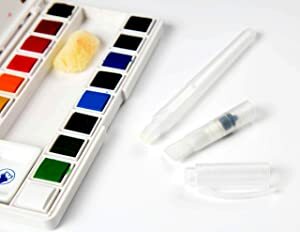 Blend with water or add ink to barrel for fast, easy, and fun watercolor painting. 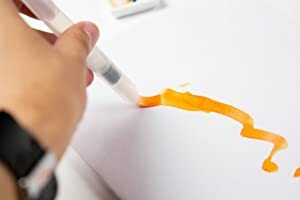 Have the freedom to paint without having to deal with Cleaning up a huge mess, Just pour water into the pen's internal tank and you are good to go, No leaks, No cups. 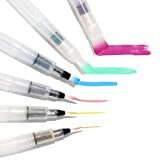 5 Multi purpose Watercolor brush pens > Not meant to be squeezed. 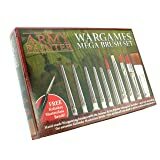 Water drips through the brush tips without need for pressure. 1 (Blue) Waterdropper Brush > Squeezable barrel to adjust water output. 1 (Pink) Tuner Watercolor Brush > Press the bulb to manually adjust & tune the water output.